The Strait of Canso Superport Corporation is a non-profit organization governed by a volunteer Board of Directors who represents various stakeholders in the Strait of Canso region. The Strait Superport aims to promote and accommodate marine operations in the Strait of Canso for the benefit of the area’s economy. They own and operate two marine facilities located along the Strait of Canso, which include the Mulgrave Marine Terminal and the Port Hawkesbury Pier. The Strait of Canso Port is located on the east coast of Canada between mainland Nova Scotia and Cape Breton Island. It is one of the finest natural deep-water harbours on the eastern seaboard of North America. The port is a major bulk port, handling approximately 68% of Nova Scotia’s international and domestic cargo tonnage and is central to offshore resources and North American and International shipping routes. Commodities shipped include, but not limited to: crude oil and petroleum products, stone aggregate, gypsum, forestry products, highway salt, coal, and gravel. Port operations and related business activities represent a large form of income and employment in the Strait of Canso area, which include the surrounding communities of Guysborough County, Richmond County, Inverness County, Port Hawkesbury, Port Hastings, and Mulgrave. 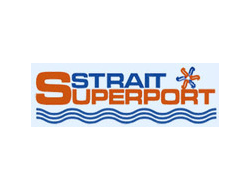 The Strait Superport continues to look for ways to expand and enhance the economic value of the port to the surrounding communities.